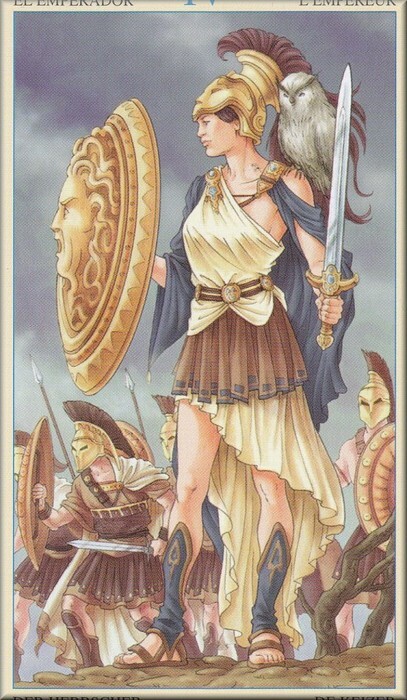 Athena is the goddess of wisdom, warfare, and crafts. She was "the daughter of Zeus and of the Titan Metis" ("Athena" 09). She was born from Zeus's head, fully grown and in full armor. Her symbols are the owl and the olive tree. Athena sprang out of Zeus's head fully armed. 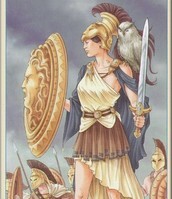 Athena is shown here in full armor. Her shield, Aegis, has the head of Medusa on it. 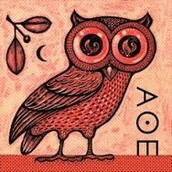 Athena's symbols are the owl and the olive tree. "Athena aided the heroes Perseus, Jason, Cadmus, Odysseus and Heracles in their quests" (Parada 97). She played a major part in the Trojan War by helping the Achaeans. She inspired Odysseus to come up with the idea of the Trojan Horse and later helped him get home. Her main weapon was her shield, Aegis. Athena was the patroness of the city of Athens, a title for which she competed with Poseidon, her main rival. "Athena caused an olive tree to spring up on the citadel of Athens" (Skidmore 14) while Poseidon created a saltwater spring. Athena became the protector of Athens because her gift was more useful. Athena's Roman name is Minerva. Athena turned Arachne into a spider when Arachne thought she was a better weaver than the goddess. In addition, Athena gave Asclepius "the blood that flowed from the veins of Medusa, ...and by that means he was able to raise the dead" (Parada 97). She is associated with birds; the owl is one of her symbols. Athena." UXL Encyclopedia of World Mythology. Vol. 1. Detroit: UXL, 2009. 130-35. Gale Virtual Reference Library. Web. 4 Nov. 2014. Parada, Carlos. "Athena." Greek Mythology Link. Carlos Parada and Maicar Förlag, 1997. Web. 05 Nov. 2014. Skidmore, Joel. "Athena." Mythweb. Mythweb, 2014. Web. 05 Nov. 2014. Stapleton, Michael. "A." A Dictionary Of Greek And Roman Mythology. N.p. : Bell, 1978. N. pag. Print.